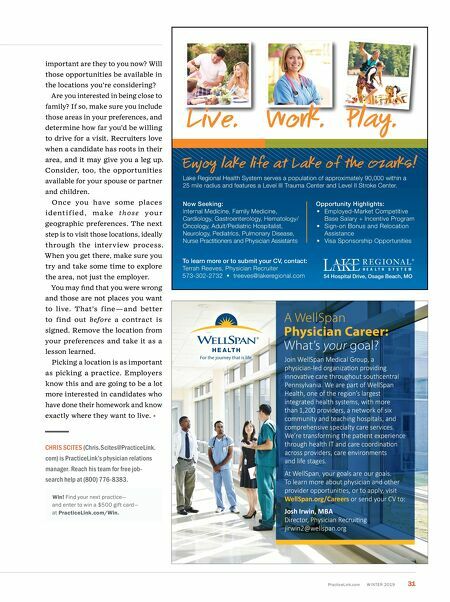 PracticeLink.com W INTER 2019 31 A WellSpan Physician Career: What's your goal? Join WellSpan Medical Group, a physician-led organizaƟon providing innovaƟve care throughout southcentral Pennsylvania. We are part of WellSpan Health, one of the region's largest integrated health systems, with more than 1,200 providers, a network of six community and teaching hospitals, and comprehensive specialty care services. We're transforming the paƟent experience through health IT and care coordinaƟon across providers, care environments and life stages. At WellSpan, your goals are our goals. To learn more about physician and other provider opportuniƟes, or to apply, visit WellSpan.org/Careers or send your CV to: Josh Irwin, MBA Director, Physician RecruiƟng jirwin2@wellspan.org Work. To learn more or to submit your CV, contact: Terrah Reeves, Physician Recruiter 573-302-2732 • treeves@lakeregional.com Lake Regional Health System serves a population of approximately 90,000 within a 25 mile radius and features a Level III Trauma Center and Level II Stroke Center. Now Seeking: Internal Medicine, Family Medicine, Cardiology, Gastroenterology, Hematology/ Oncology, Adult/Pediatric Hospitalist, Neurology, Pediatrics, Pulmonary Disease, Nurse Practitioners and Physician Assistants Opportunity Highlights: • Employed-Market Competitive Base Salary + Incentive Program • Sign-on Bonus and Relocation Assistance • Visa Sponsorship Opportunities 54 Hospital Drive, Osage Beach, MO important are they to you now? Will those opportunities be available in the locations you're considering? Are you interested in being close to family? If so, make sure you include those areas in your preferences, and determine how far you'd be willing to drive for a visit. Recruiters love when a candidate has roots in their area, and it may give you a leg up. Consider, too, the opportunities available for your spouse or partner and children. Once you have some places ident i f ie d , m a ke th os e you r geographic preferences. The next step is to visit those locations, ideally through the interview process. When you get there, make sure you try and take some time to explore the area, not just the employer. You may find that you were wrong and those are not places you want to live. That's fine — and better to find out before a contract is signed. Remove the location from your preferences and take it as a lesson learned. 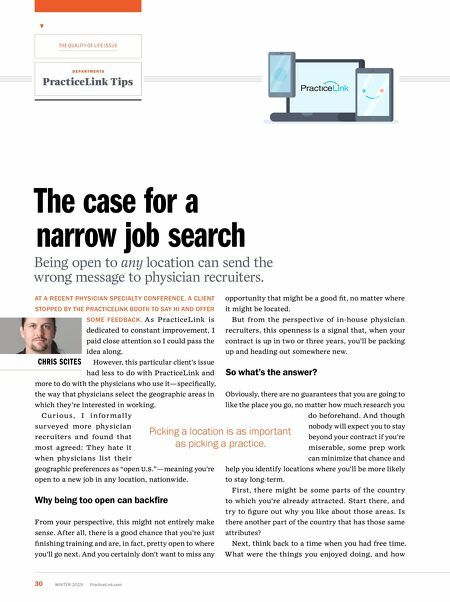 Picking a location is as important as picking a practice. Employers know this and are going to be a lot more interested in candidates who have done their homework and know exactly where they want to live. CHRIS SCITES (Chris.Scites@PracticeLink. com) is PracticeLink's physician relations manager. Reach his team for free job- search help at (800) 776-8383. Win! Find your next practice— and enter to win a $500 gift card— at PracticeLink.com/Win.